Buenos Aires, Argentina - His Eminence Amphilohije, Archbishop of Cetinje, Metropolitan of Montenegro and Bishop-administrator of the Diocese of Buenos Aires and South America arrived Tuesday, December 17, 2013 after a US visit where he took part in the Episcopal and Central Council meetings of the Serbian Orthodox Church of North and South America. This is Metropolitan Amphilohije's third visit to South America since he was named administrator of this newly established diocese in May 2013 at the Holy Assembly of Bishops of the Serbian Orthodox Church. Metropolitan visited Argentina in 2007 while it was still under jurisdiction of the Diocese of Eastern America. He was welcomed by the Serbian Orthodox clergy from Argentina at the Nativity of the Most Holy Theotokos Cathedral Church in Buenos Aires, the diocesan see. On the feast day of St. Nicholas of Myra and Lycia, Metropolitan Amphilohije served the liturgy at St. Sava Church, the oldest Serbian Orthodox church in Buenos Aires, with the concelebration of the diocesan clergy. Metropolitan Amphilohije visited the Montenegrin community in the town of General Juan Madariaga on December 20th and served Vespers at the “Njegos” Society. In his homily afterward he read parts from the “Mountain Wreath” in Spanish, in which the author St. Petar II Petrovic Njegos describes the way Montenegrins and Serbs in general defended their true faith before the Islamic threat of the 17th century. In his homily the metropolitan compared this defense of the faith with the work of St. Constantine the Great and his Edict of Milan, for the freedom of confession in 313, with which the persecution of Christianity ended and whose 1700th anniversary we celebrated this year. On Saturday, December 21st Metropolitan Amphilohije served the liturgy at the Nativity of the Most Holy Theotokos Cathedral in Buenos Aires with the concelebration of Metropolitan Siluan of Beunos Aires and Argentina (Patriarchate of Antioch) and Bishop John of Caracas and South America (Russian Church Abroad), the dean of the church Fr. Bosko Stojanovic, clergy and faithful. Following communion, which many partook of, the Metropolitan handed out icons and small church calendars which for the first time were printed in both languages, Serbian and Spanish. These calendars were distributed to all of our parishes in South America. At the luncheon Metropolitan greeted all present, especially the hierarchs and presented them with gifts among which was also a copy of “The Mountain Wreath” (“La Guirnalda de la montaña”), in both languages, Serbian-Spanish, from a 1980s edition published in Chile, translated by Jorge Razmilic Vlahovic and Andrija Rajevic Bezmalinvic. Two hundred copies of this book were recently donated to the Serbian Orthodox Diocese of South America by Elena Razmilic from Santiago. Metropolitan Amphilohije then presented the Order of St. Petar of Cetinje to Protodeacon Nikola Radisa, president of the church board in Buenos Aires, which was presented to him by the Holy Synod of Bishops of the Serbian Orthodox Church per the recommendation of Metropolitan Amphilohije. Fr. Nikola received the Order for this contribution to construction of the Nativity of the Most Holy Theotokos Cathedral and preserving the spirituality, tradition and culture of our people in Argentina. His Eminence Amphilohije, Archbishop of Cetinje, Metropolitan of Montenegro and Bishop-administrator of the Diocese of Buenos Aires and South America officiated at the Liturgy on Sunday, December 22nd on the occasion of the Church Slava of the St. Nicholas Church in Machagai, Provincia de Chaco. The largest number of our Serbian migration in Argentina is in this province, mostly Montenegrins, and this church was built in the 1930s thanks to the faith of our people and the commitment of the Russian priest Alexander Konovalenka. 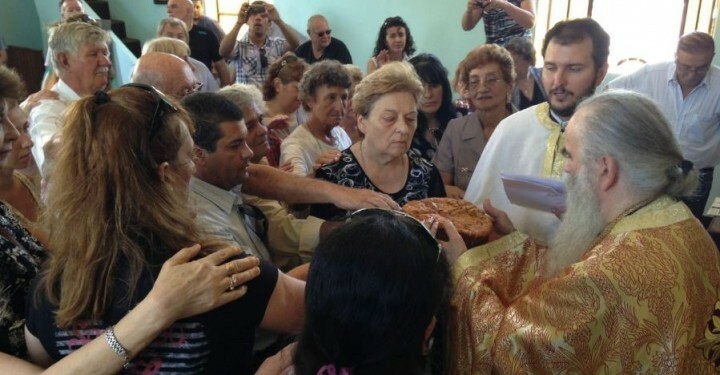 For a little over a year ago, the parish priest of this church, in charge of the entire province of Chaco, by the blessing of Metropolitan Amphilohije, has been Fr. Branko Stanisic. Metropolitan served the festal liturgy with the concelebrant of Fr. Branko and Protodeacon Nikola Radisa, with over two hundred in attendance. Speaking at the festal luncheon were Metropolitan Amphilohije, Fr. Branko Stanisic and Juan Vulekovic, the president of the church board in Machagai. On the same day Metropolitan visited the recently renovated “Durmitor” club, the first voluntary-educational center for our people in Chaco, which Fr. Branko blessed with the then governor of Chaco present, and current chief of cabinet of the minister of the government (in the presidential system of Argentina this is equivalent to the position of premier), also a descendent of our migrants, Jorge Milton Kapitanic. The metropolitan then visited the St. George Church in La Tigra and the Holy Trinity Church in San Bernard, built by Ukrainian immigrants of which there are also many in this province. Fr. Brano also cares for their spiritual needs as he is the only Orthodox priest in this province. The metropolitan was welcomed in both of these places by the members of the Orthodox communities, while in San Bernard the metropolitan gave an interview for the local television station.